You could win a J/70! The Greenwich Bay Sailing Association (GBSA), a non-profit community sailing program established by the East Greenwich Yacht Club in East Greenwich, RI, is holding a fundraising raffle and one lucky sailor will become the owner of a brand new J/70 with a trailer. 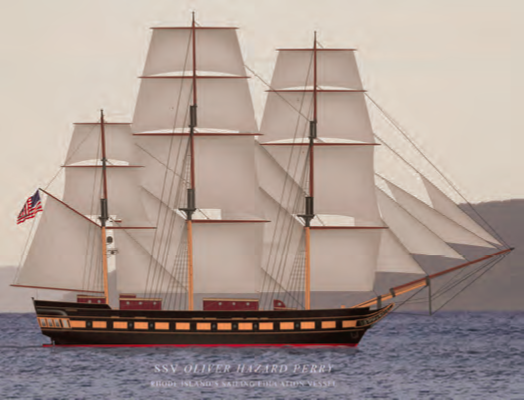 The final construction phase of Rhode Island’s Official Sailing Education Vessel, the SSV Oliver Hazard Perry, is underway. The ship’s two Caterpillar C-12 main engines, provided by Milton Cat in Milford, MA, one of the Perry’s Marine Trades Partners, were installed at Senesco Marine in North Kingstown, RI in December. Each of the 12-liter, inline 6-cylinder engines has a rating of 385 hp at 1,800 rpm and is certified to run on a 20% biofuel-to-diesel blend that will be provided by Newport BioDiesel, another of the ship’s Marine Trades Partners. The 200-foot, steel-hulled Perry will be moved this winter to Newport Shipyard, where the lower masts, Douglas fir upper mast sections and 16 yards will be installed. Currently half completed, her 20 sails continue to be made by Hood Sails, and the rigging team is in place to take delivery of the masts and spars in February. The ship’s entire inventory of interior paneling, fixtures and equipment has been ordered and partially installed. The Perry will set sail this summer as the first oceangoing full-rigged ship to be built in the U.S. in 110 years. With her threemasted square rig towering 13 ½ stories high, she’ll be second in size only to the U.S. Coast Guard’s Barque Eagle among American tall ships. She will sail along the Eastern Seaboard and throughout the Caribbean, and her calendar of operations includes seven oneweek onboard coastal Sea Camp programs for ages 13-18. Berths for Sea Camp are filling fast. For more information and to make a reservation, visit OHPRI.org. 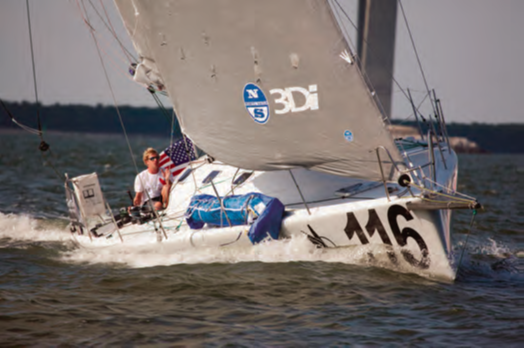 The fourth edition of The Atlantic Cup presented by 11th Hour Racing, the only dedicated Class40 race in the United States, starts Saturday, May 10, 2014 in Charleston, SC. The Atlantic Cup is also the country’s most environmentally sustainable sailing race. 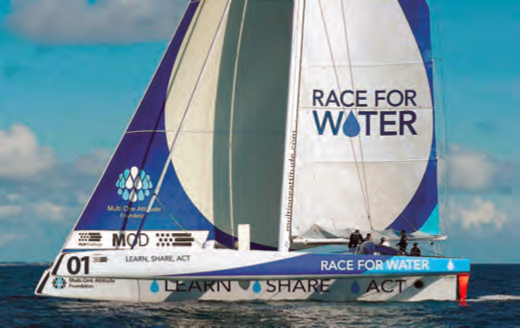 The organizers, Manuka Sports Event Management of Newport, RI, have announced two new land-based supporting events, Water Week NYC and Bay Weekend Newport, to draw further attention to water resources. On the first leg of the race, doublehanded crews will sail 648 miles from Charleston to New York, NY. Following the success of Living on the Edge, The Atlantic Cup’s gala event in New York in 2013, E3Think and Manuka Sports have co-created Water Week NYC, a global platform to share and co-create innovative water solutions. Stakeholders from the global water industry will gather for over 50 high-profile meetings and events to share business opportunities and showcase the latest water technologies on topics from marine plastics and sea level rise to supplying north China with water to urban water infrastructure challenges. Surrounded by a diverse group of business, government, arts and civil society players, Water Week NYC will culminate with the week’s marquee events: Living on the Edge 2.0 and the start of the second leg of The Atlantic Cup, from Battery Park City. The 231-nautical mile Coastal Leg brings teams to Newport, RI, where they will contest a two-day inshore series with a crew of six. Celebrating Narragansett Bay with a focus on community outreach and awareness, Bay Weekend Newport is an opportunity for local businesses and non-profits to gather and engage the community with emphasis on sustaining Narragansett Bay. Of the many organizations already committed to supporting Bay Weekend, Clean Ocean Access, a Newport area volunteer-based organization, is spearheading an Atlantic Cup course-wide cleanup from the Pell Bridge south to Beavertail (in Jamestown) and south to Castle Hill (in Newport). “We are proud to have 11th Hour Racing as our presenting sponsor for a fourth year,” said Race Director Hugh Piggin. “With their help, we have been able to build The Atlantic Cup into the premier U.S. offshore race with a powerful sustainability message. In addition to what promises to be a hard fought competition on the water, we are looking forward to our newly created land-based events as there will be more ways than ever for our fans to engage with the race.” For more on The Atlantic Cup and its Green Initiatives, visit atlanticcup.org. This May, the Charles W. Morgan will embark on an unprecedented voyage to historic ports on the New England coast. Over an 80-year whaling career, the ship sailed on 37 voyages to the remote corners of the globe. This voyage, her 38th, may perhaps be her most important. 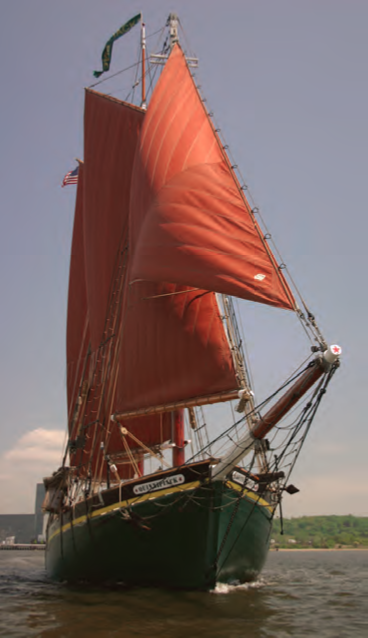 A National Historic Landmark, the Morgan is the oldest American commercial ship still afloat. 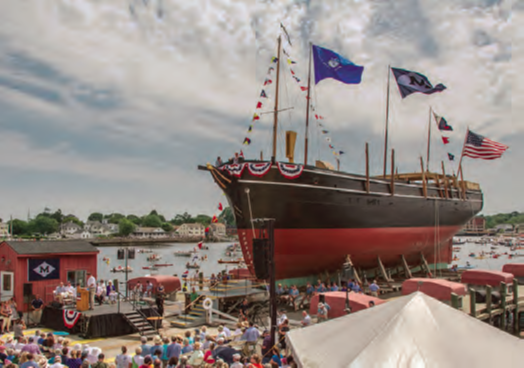 The ship underwent a nearly five-year restoration in the Henry B. duPont Preservation Shipyard at Mystic Seaport in Mystic, CT and was launched July 21, 2013. The 38th Voyage, which is expected to take about six weeks, will begin with a short trip from Mystic to New London, where the deep harbor and ready access to Long Island Sound will be used to prepare her for sea and to conduct sail training with the crew. The ship will then journey to Newport, RI, Vineyard Haven and New Bedford, MA, the Stellwagen Bank National Marine Sanctuary, Boston, and then back to New London and Mystic with a stop at the Cape Cod Canal to participate in its centennial celebration. Stopovers in each port will have dockside exhibits customized for each location. New Bedford’s history is inextricably tied to its whaling heritage and it was here in 1841 that the Morgan was built and it was her homeport for 60 years. Boston will be an opportunity to tie up next to the USS Constitution, the only American ship older than the Morgan. Stellwagen Bank is a center for whale watching, and the Morgan will moor offshore near Provincetown and conduct a number of daysails into the Bank in collaboration with the National Oceanographic and Atmospheric Administration. The 38th Voyage will utilize the latest technology to appeal to all ages and to build an experience that communicates four major themes: the American sailor as an icon, the influence of different cultures connecting at sea, whaling as an example of American enterprise, and America’s changing relationship to the natural world. The last is the most significant, because whales were hunted almost to extinction. Where once the Morgan’s cargo was oil and bone, today her cargo is knowledge. When the 12th edition of the Volvo Ocean Race begins, with an In-Port Race in Alicante, Spain on October 4, 2014, teams will be sailing all-new 65-foot boats called Volvo Ocean 65s. Designed by Farr Yacht Design in Annapolis, MD, the Volvo Ocean 65 is a one-design boat created to strike a balance between speed, safety and affordability. 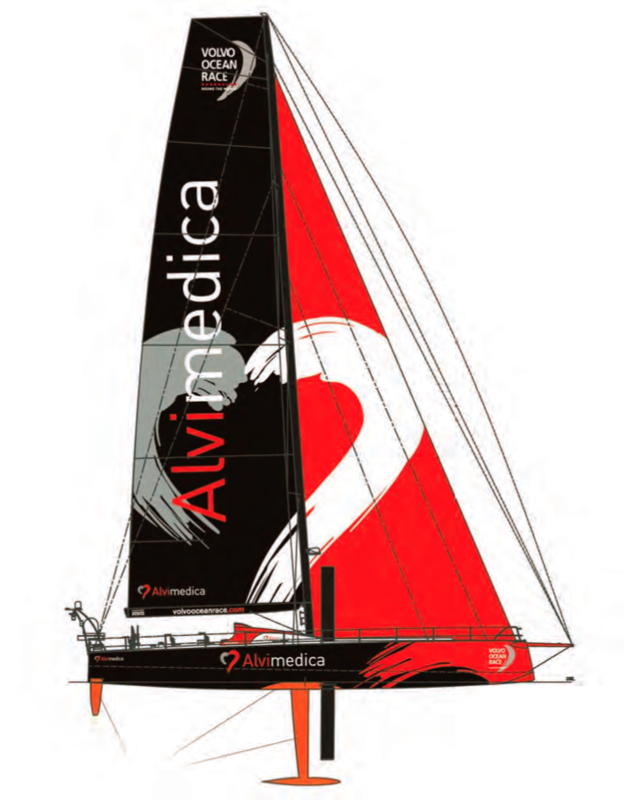 in the race since 2001-02, Team SCA were also the first to announce their participation in the event. medalist Ian Walker as skipper. from the Netherlands, skippered by race veteran Bouwe Bekking. miles. In-Port Races are scheduled for each of the 10 stopover cities. On the sixth leg, teams will sail 5,010 nautical miles from Itajai, Brazil to Newport, RI, where an In-Port Race is scheduled for May 16, 2015. The event wraps up with a final In-Port Race in Gothenburg, Sweden on June 27, 2015. For more information, visit volvooceanrace.com. Schooner, a community sailing center in New Haven, CT, has launched a major fundraising effort. “Schooner celebrates two landmarks this coming year,” said Executive Director Kristen Andrews Seda. “Since 2005, Schooner has offered small boat sailing camps and lessons. Still feeling the effects of two years of serious storms and many years of hard use, we are re-starting our small boat waterfront with new docks at our City Point location, new boats, and a long-term plan that will keep us sailing for years to come! In order to do that, we need your help. Please consider a donation to help make the New Haven Waterfront a vibrant and exciting place for all of us, but especially our children, to enjoy. Also, we are looking for any help or advice in our fundraising effort, including grant writing, corporate sponsorships and donor cultivation. Please email director@schoonerinc.org if you’d like to join the team!” Log onto schoonerinc.org for more information. prevailing economic conditions. The event, originally scheduled for May 2014, is moving to a four-year cycle and alternating with the Route du Rhum. The 2016 KRYS Ocean Race will evolve and broaden its scope by welcoming all multihull classes over 50 feet LOA (Multi 50, MOD70, and Ultimate). The expanded fleet will sail a 2,950-nautical mile course from Brest, France to New York, NY. The course record, set by the MOD70 Spindrift Racing in 2012 when the fleet sailed from New York to Brest, stands at 4 days, 21 hours, 8 minutes and 37 seconds. Visit multionedesign.com for more information. The Alpha 42’s interior is available in an Owners Version with a full-length master suite in a 3-cabin, 2-head layout, or a Charter Version that sleeps up to 8 in a 4-cabin, 4-head configuration. A pair of 30-horsepower Yanmar diesel engines with sail drives provide auxiliary power, with 40-horsepower Yanmars optional. Proudly built in Patchogue, NY by the craftsmen at Alpha Yachts, the Alpha 42 was engineered by Alpha Yachts President Marc Anassis. A naval architect who has built more than 850 boats, Anassis says the Alpha 42 is the stiffest, strongest boat he has ever built. “It has been a hard but very rewarding adventure building our first Alpha 42,” said Tarjan. “We presently have three further units in construction.” Based in Setauket, NY, Aeroyacht is the world’s largest multihull dealership, representing 11 brands of catamarans and trimarans. Visit aeroyacht.com for more information. The American Sailing Association (ASA) and Hobie Cat® Company have launched a worldwide partnership with a goal of attracting new sailors to the sport. The catalyst will be the global excitement generated by ORACLE TEAM USA’s come-from- behind victory in the 34th America’s Cup, a targeted sailing education program developed by ASA, and a special edition Hobie catamaran. 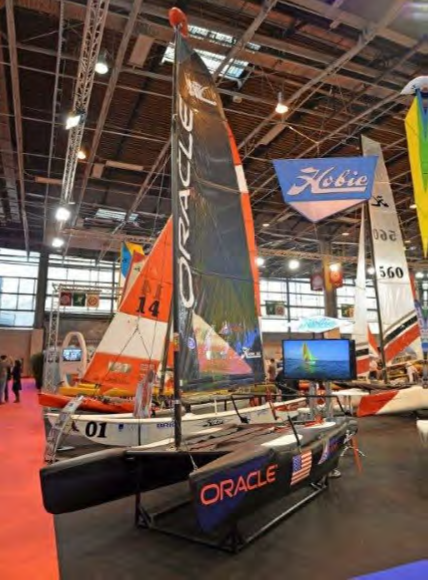 The first boat in a series of special edition ASA/Hobie catamarans made its debut at the Paris Boat Show in December. new educational program. 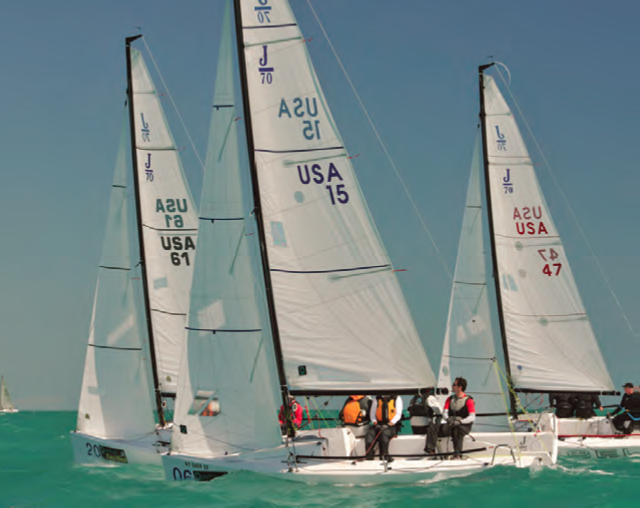 The education arm of the partnership will be a new educational program at ASA schools featuring the new Hobie Cats. 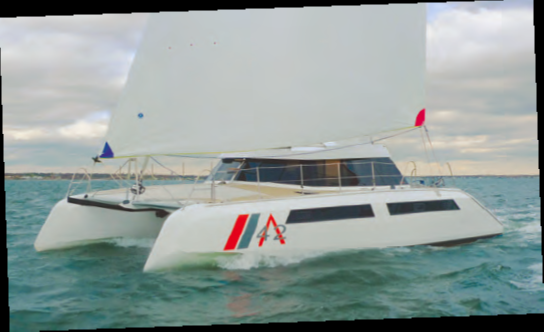 ASA’s catamaran program will also be available for use by sailing and yacht clubs around the world. For more information, visit asa.com and hobiecat.com. Beginning May 1, 2014, boaters in New York will be required to pass an eight-hour boating safety course in order to legally operate a mechanically powered boat in New York waters. The new law, signed by Governor Andrew Cuomo last fall, will be put into effect over a period of years. It will initially apply to boaters age 18 or younger, while older boaters would be exempt. First time violators would face fines of $100 to $250. Parks, Recreation, and Historical Preservation.